Feb 19, 2017; San Diego, CA, USA; San Diego State Aztecs guard Trey Kell (3) shoots as UNLV Rebels forward Tyrell Green (3) and guard Kris Clyburn (1) defend during the second half at Viejas Arena at Aztec Bowl. 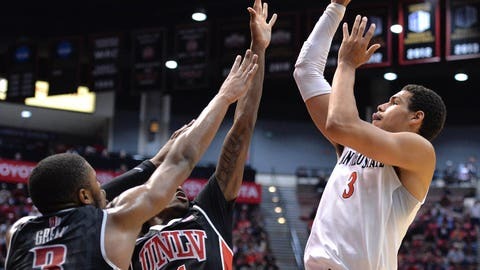 San Diego State basketball’s Trey Kell put the team on his back in 2017 to lead the Aztecs on a deep run in the Mountain West Tournament. Now, he has been rewarded for his heroic efforts. The junior guard was named to the National Association of Basketball Coaches (NABC) All-District 17 Second Team on Wednesday, marking the second consecutive year he has received the honor. A San Diego native, Kell led his Aztecs with team highs in points per game (13.2), assists (2.9), steals (1.4) and free-throw percentage (.766). He also led the team in minutes per game at 31.8 and shared the lead for games played with senior guard Dakarai Allen in games played (33). Kell also led the team in points, rebounds and/or assists in 15 of the Aztecs’ 18 games against MW opponents in the 2016-17 season. In addition to being named to the NABC All-District 12 Second Team, Kell was voted onto the all-MW third team by the league’s head coaches and members of MW media. Kell is the 12th consecutive Aztec to represent the Scarlet and Black on either of the to District 17 teams. He share’s this year’s Second Team honor with New Mexico’s Elijah Brown and Tim Williams, Utah State’s Jalen Moore and Nevada forward Cameron Oliver. With Allen leaving the Mesa due to graduation, Kell will need to continue to dominate in the MW to lead the Aztecs’ back court as a senior in the 2017-18 season.